29 clues contain an extra word to be removed before entry. First and last letters of words removed from across clues indicate a speaker and his creator. First letters of down clue removals give a demand from the speaker suggesting how answers to nine normal clues must be amended before entry. 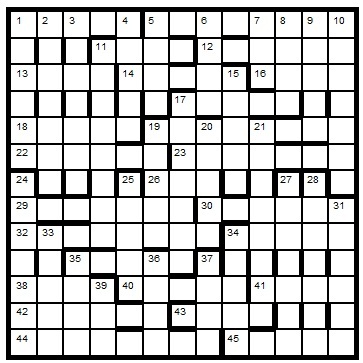 In the completed grid, solvers must highlight four entries which fail to comply with the speaker's demand. Lengths given with clues refer to grid entry length. The Chambers Dictionary (2011) is the primary reference. To enter this competition, send your entry as an image or in list format, indicating the highlighted words, to derekharrison@yahoo.com before the 8th December 2014. The first correct entry drawn from the hat will receive a book from the Chambers range which has been donated by Chambers.